UTIG Master’s student Mario Gutierrez was recently awarded an Endowed Presidential Scholarship by the Michael Duchin Endowment. 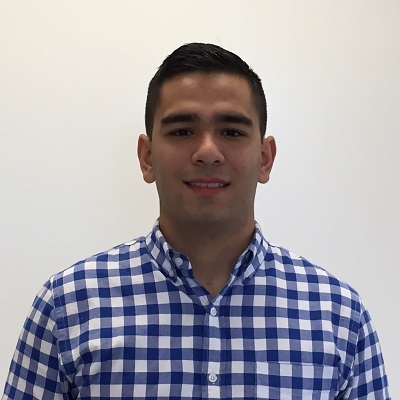 We caught up with Mario to learn about his work and studies here at UTIG. What are you studying? My thesis topic focuses on Lithologic Calibration of Neogene Mass Transportation Deposit Seismic Character in Mississippi Canyon of the Northern Gulf of Mexico. I focus on this work as part of the GBDS project at UTIG. What does being awarded the Endowed Presidential Scholarship mean to you? I am so fortunate to be nominated and considered for this award to help further my studies here at UTIG. What sparked your interest in geoscience? I was originally a music major at Ohio State University but changed paths to geoscience for the challenge and drive. While an undergrad, I had an internship with a deep water stratigraphy project in the Gulf of Mexico which spring boarded my research and interests towards deepwater geoscience. Why did you choose to study and work at UTIG for your graduate work? When I was looking at my interests in deep water projects, very few schools had the capabilities of UT and UTIG. It was a good fit for what I was interested in and what I want to do after I graduate. It’s been a great year and half, I’ve learned a lot and developed as a geoscientist. What’s been your favorite part of graduate school so far? I love the classes for the ability to learn, the opportunity to interact with renowned faculty, and the amount of science resources at my fingertips. There is always someone who knows something about something here and willing to answer your question. There are a lot of opportunities in geosciences no matter what your focus is and I’m fortunate to be here because there are so many types of grants and funds that we have access to here at UTIG. What’s your advice to other graduate students? Whether you want to go to work in industry or academia, start investing in networking early and integrate into the community of your area of interest. Too many people wait to look at the next step until later in their program but that’s too late. You want to hit the ground running before you graduate. What are your plans for after graduation? I’m going to travel around the world for a few months, including visiting my family in Colombia. I plan to start as an Exploration Geoscientist at ExxonMobil in Fall 2018.